Cardaria draba (L.) Desv., Journ.Bot.Appl. 3:163. 1814. Hedge in Davis, l.c. 285; in Rech.f., l.c. 75. Perennial, 20-60 (-80) cm tall, erect, branched mostly from the base, usually hairy with short appressed simple or forked hairs. Lower leaves 3-10 cm long, 1-4 cm broad, obovate-spathulate, stalked, sinuately toothed; upper leaves 1-5 (-8) cm long, 1-3 cm broad, oblong-lanceolate or ovate-oblong, amplexicaul, toothed, rarely entire, sessile. Racemes 25-50-flowered, corymbose, up to 10 cm long in fruit, ebracteate. Flowers c. 5 mm across, white; pedicel up to 10 mm long in fruit, filiform, spreading. Sepals c. 2 mm long, oblong. Petals about twice as long as the sepals, spathulate, clawed with subemarginate apex. Stamens 6, c. 2:3 mm long with minute anthers. Siliculae ovate, ± cordate, 4-5 mm long, 3.5-4.5 mm broad (excl. c. 1.5 mm long style); valves keeled, reticulately veined, glabrous; septum c.l mm broad; seed c. 2 mm long, ovoid or ellipsoid. Type: Described from C. Europe. Distribution: Chiefly European species, now widely spread in C. and W. Asia, introduced elsewhere. 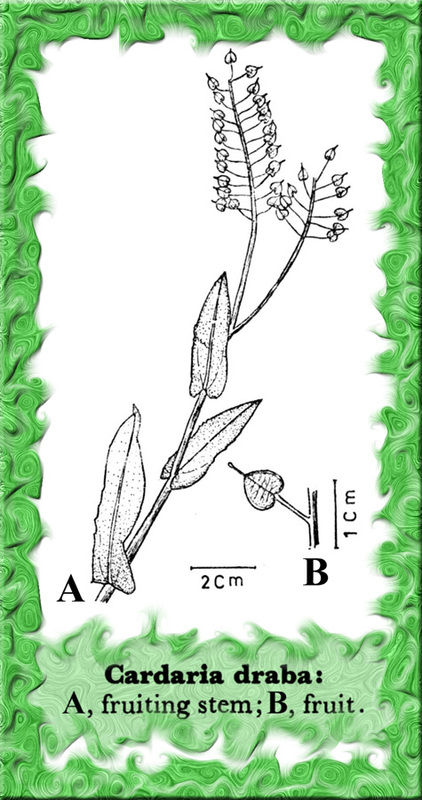 There can be no doubt that the above cited specimen is true C.draba. It appears to be a recent introduction in our area. Careful collection may now reveal its wider occurrence in W. Pakistan also. The seeds have spicy flavour and may be used as a substitute for pepper.